What are the visiting hours to Machu Picchu? As of July 1, 2017, the entrance to Machu Picchu is in two shifts: morning and afternoon. Depending on the type of ticket you choose (Huayna Picchu, Museum, Machu Picchu mountain), you can enter tomorrow or afternoon. This measure was adopted in order to guarantee more fluid visits and for the conservation of the Wonder of the World. What is Machu Picchu’s opening hours? What is the schedule Machu Picchu mornig shift? What is the schedule Machu Picchu afternoon shift? What is the opening hours of the Huayna Picchu? What is the opening hours of the Machu Picchu mountain? What is the opening hours of the Machu Picchu Museum? What is the departure time of the train to Machu Picchu? What is the departure time of the buses to Machu Picchu? Machu Picchu attends every day of the year including Sundays and holidays. Visiting hours are from 6 am to 5.30 pm The ‘Inca Citadel’ is closed at night. How is the visiting time Machu Picchu morning shift? The morning sun is the right time to see the attractions of Machu Picchu in all its magnitude. In addition, entering very early will allow you to have the Inca Citadel as alone as possible. During the rainy season (from November to March), fluvial rainfall is not frequent at this time. Includes: All Inca buildings (Main Temple, Temple of the 3 Windows, Intihuatana, Temple of the Sun, Temple of the Condor, Royal Palace, etc.). Visitors who enter from 9 a.m., 10 a.m. or more, may stay a maximum of 4 hours after entering Machu Picchu. How is the visit time Machu Picchu afternoon shift? Photography lovers believe that the afternoon is the best time to capture the best images of Machu Picchu. In addition, in one way or another, during the afternoon there will be fewer people in the place. At that time, in the rainy season (from November to March), the rains could grant a multiple rainbow spectacle without equal. Includes: All the Inca buildings of Machu Picchu. Visitors who enter the afternoon shift and arrive early to Machu Picchu can check in from 11 a.m.
What are the hours of service for Huayna Picchu? The mountain Huayna Picchu remains open every day of the year. Your schedule is in the morning shift (from 7 am to 2 pm). Entrance to the mountain Huayna Picchu from 7 am to 8 am. The Machu Picchu mountain is also open every day of the year. The hours of operation are in the morning shift and part of the afternoon (from 7 am to 3 pm). The Machu Picchu Site Museum ‘Manuel Chávez Ballón’ attends from Monday to Sunday from 9 am to 4.30 pm Admission is at any time of the day. The tourists who make the visit in the afternoon shift (from 12 pm to 4 pm), enter the Machu Picchu Museum for free. The Machu Picchu Site Museum is located in the town of Aguas Calientes, on the road that leads to the Inca Citadel. The trains to Machu Picchu connect the city of Cusco (or the town of Ollantaytambo) to Aguas Calientes, the famous town located at the foot of the Inca Citadel. These are the train schedules to Machu Picchu. The buses to Machu Picchu depart from the town of Aguas Calientes to the entrance gate to the Inca City. The departure time of the buses is not exact. The first buses leave at 5.30 am The last buses depart at 3.30 pm The departure frequency is 10 to 15 minutes. Machu Picchu tickets that include the mountains are very limited. The Huayna Picchu ticket must be reserved 4 months before. Train tickets must be reserved after knowing the exact date when you will leave for Machu Picchu. 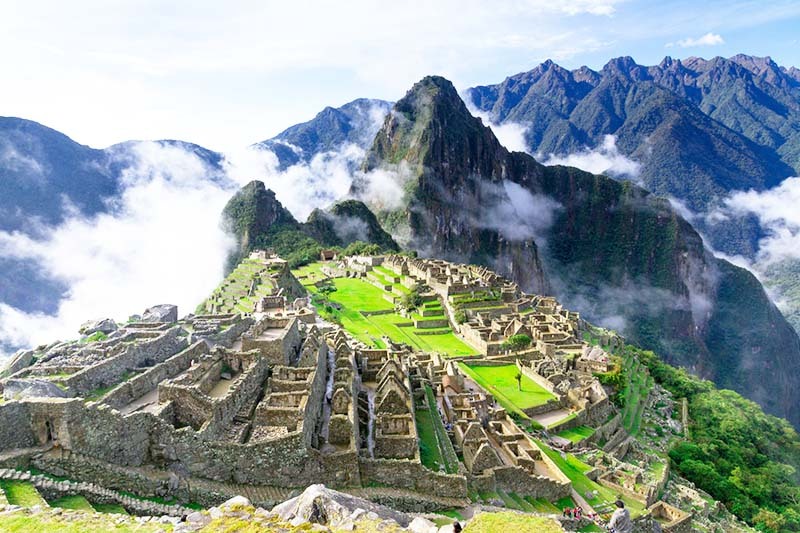 The Machu Picchu ticket in any of the 2 turns includes the possibility of short walks like the Inca Bridge or the Puerta del Sol (old main entrance of Machu Picchu). To acquire the Machu Picchu morning shift, it is recommended to sleep in Aguas Calientes the night before. So you can enter very early. You will not be able to enter Machu Picchu without a guide. You can hire one at the entrance door. The groups are of maximum 16 people.